This is a photo of a "portable" radon detector. The circuitry is similar to my other ionization chambers. The chamber is a large coffee can with an almond can shield on the back for the electronics. The filter is a 4" plumbing coupler glued to the intake of a squirrel cage fan. 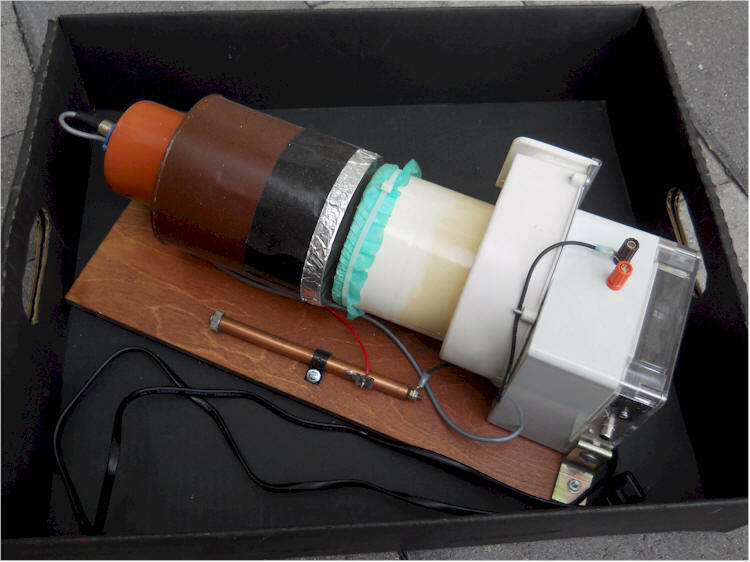 The motor for the fan is inside the plastic box, as is the molded power supply and a 3.5 digit meter. I brought the 12 volts from the power supply out on two banana plugs in case I needed additional power for who-knows-what. The high voltage is provided by 6, "10A" 9 volt batteries in the copper tube ( a homemade battery holder). This is just a hobby project and not a serious radon detector. There's no reasonable way to calibrate it.